Listeners of the podcast would know that I have been delving into Second Life recently. The GGP number 69 Special edition just came out also, recorded entirely in Second Life. 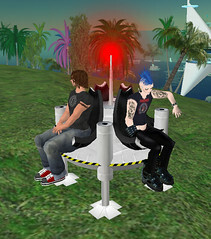 I am really enjoying Second Life, the chatting and the interaction has been great. But this week I went looking for some excitement… I found it. Second Life gives people the ability to do just about anything they want to. I am slowly discovering how far that can go. I have always wanted to go skydiving, when a Second Life (SL) friend offered to take me in SL I jumped at the opportunity, we had a blast! First up I was given a free parachute. Now the free version is not that great but it works. It puts you into a freefall pose and stops you hitting the ground with an auto deploy. On your float down you can see the canopy wires and nothing else. There is also no control over flight direction. So we did a bit of jumping from high objects in SL. These came in the form of floating platforms that we flew up to. If you want to give this a try in SL you will need “The Flight Feather”. Without it you won’t be able to fly very high, you reach a ceiling and go no further, with it the ceiling is 4000 meters. One thing worth noting is that the spatial awareness of the voice communication in SL really added to the experience. Imagine the diminishing volume coming from an avatar that just jumped off a building! Adds to the reality and the fun of it all. So we did a few drops with our pods and our new chutes. I laughed so hard and so long I had tears running down my face. My jump buddy was likewise impressed with the experience, we got some awesome photos, especially since they were taken with the new beta version of the viewer; WindLight. Another day dawns on SL. One of the absolute funniest things that happened during this time was that we found a great dropzone and went from the pod at 4000 M. In SL you can build in the sky, as long as you stay on the alloted area that defines your land. Seems we found a wayward building on this jump and smacked straight into it at Terminal Velocity. You might see it in the photo, but yup that is a graveyard, it seems we were not the first to discover it. Note the structures in the back ground (you can’t see them at 4000 M!). Yesterday, we found that there was a model up from ours and we went ahead and bought the “Pro” version for an extra 100 Lindens. Money well spent and we should have got this one in the first place since it was a bit over one US dollar! Using the new chutes we found that we were able to also do co-ordinated stunt work, have heaps more fun and even attempt some base jumping. Although the base jumping has it’s issues, note the above example. The closer you are to the ground the more sky junk there is, we discovered a lot of it. I have also base jumped from the new HQ of The Podcast Network in SL, I think that is a first. We are on the lookout for more sites to jump from so let us know if you find anything in SL that you think is worth a look. There is a lot more to this than I have included here. It is damn fun though and if you would like some help getting started then look me up in SL. My name in Second Life is “Rooster Rubble”. Say hello and how you know me. Don’t forget to get the viewer and register first! Finally this is the best photo that was taken by CannedTuna on our first dive into Skydiving in SL, impressive isn’t it? 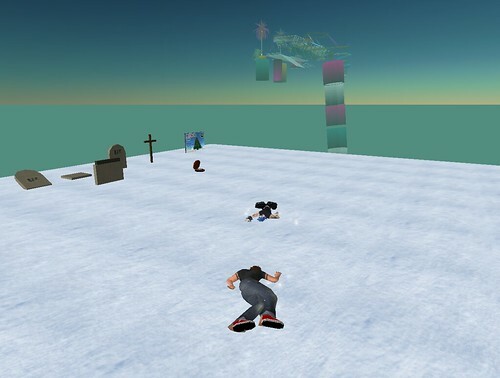 Also thanks to Gary for being by jump buddy and exploring skydiving in Second Life. This is great news, although it did happen a few days ago now. But when it did we were in full swing getting the podcast ready and that means I have little time to blog anything. The Podcast Network announced the launch of a brand new version of the homepage. Complete with Ajax goodness and a completely different look. If you know nothing about podcasts there are links at the top to get you up to speed and listening to some great content. TPN is a the place to look for good regular podcasts. The right hand side menu gives you all the podcasts on The Podcast Network, separated into categories. If you have not visited The Podcast Network before and want to know what it is all about, now is as good a time as ever. Nice work Cam and the development team. Next the show blogs! (That was a hint). The Global Geek Podcast belongs to The Podcast Network. Hosted by Knightwise and myself weekly. Here is our latest show if you enjoy it, head over to our blog on TPN and subscribe. In addition to that I also post regularly there as well as here.